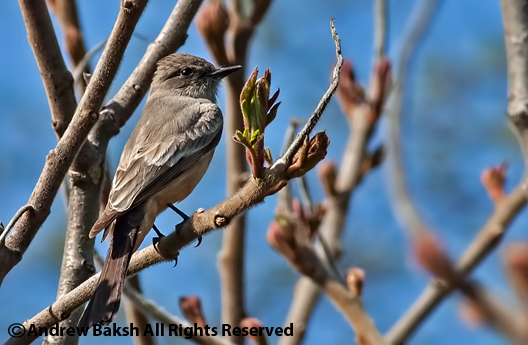 Yesterday, yet another rarity for Brooklyn Prospect Park was found, when birder Ryan Bass spotted an interesting flycatcher that turned out to be a Say's Phoebe Sayornis saya. 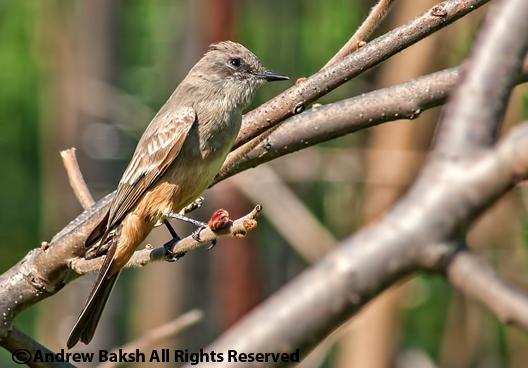 The Say's Phoebe, is in the Tyrant-Flycatcher family and a common bird in the western United States but rare in our area. I was on Long Island having just seen a splendid looking Red-headed Woodpecker with Andria, Tom Burke, Gail Benson and Steve Walter thanks to intel from Sam Janazzo who had returned to the area where he had first found the bird on Friday to find it again yesterday morning. The report of the Say's Phoebe was not definitive, so I put in a text to my friend Heydi Lopes to get some additional information. I received a response that the ID was confirmed and Tom Burke also got word that the ID was good. The problem was the bird had gone missing. I played it cool and instead of immediately running out to Brooklyn decided to bird the barrier beach some more. I nevertheless kept checking in with Tom (who had departed LI for Brooklyn) and it was around 1:47 p.m. or so that I received word from Tom and Heydi that the bird was re-found in the same it area it was first seen in the morning. The chase was on! 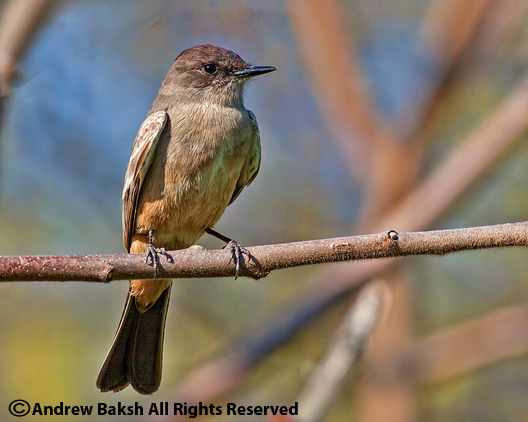 45 minutes later after traffic and angst over getting parking that late in the afternoon, I walked into Prospect Park with Andria and set eyes on a Say's Phoebe, with its pale brownish gray chest that goes into its belly and the cinnamon color that goes into its under-tail. Tom and Gail in their usual altruistic selves, had waited all that time with the bird until I arrived with Andria who got her life and state Say's Phoebe. This was not a life nor state bird for me having seen two on Long Island and my lifer in Arizona, but this was the most cooperative Say's Phoebe that I have seen and I spent well over two hours watching the bird and helping others to get on it as they arrived. Unfortunately, around 5:05 p.m. the Say's Phoebe suddenly picked up and flew off heading in a South Easterly direction and was not seen again all afternoon into the evening despite good coverage by several birders. When I left the park around 6:30 p.m. there was one birder vigilantly staking out the Sumac spot hoping for a return. Hopefully, it will be found again today and others will get to see this neat bird. Nice bird for Brooklyn following the Varied Thrush! Here are a few additional photos. It has been rather slow with the migrants, so I have recently spent some time exploring new places to bird in the Bronx and Queens. In the Bronx, I finally found my first Yellow-crowned Night Heron for the county, a long overdue bird. Andria who birded with me counted 11, knowing that there was a good chance of additional birds in the area. 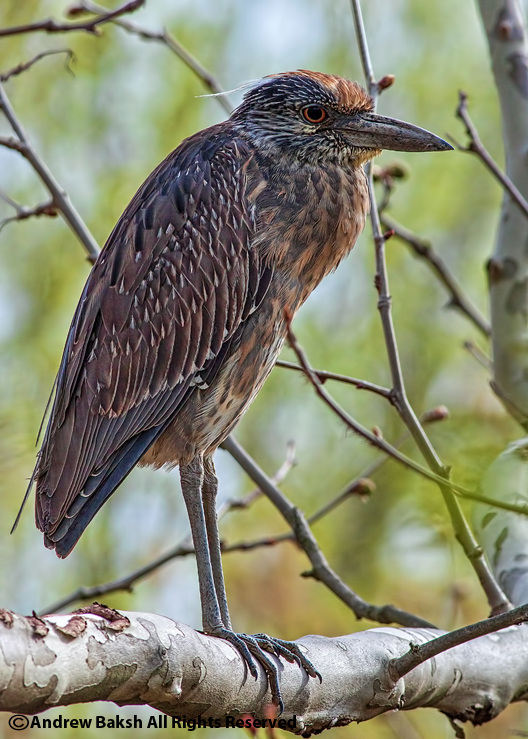 Here is an image of one that I thought the plumage was nice enough to photograph. In addition to the YCNH, Andria found a Little Blue Heron, which while not a Bronx first for me was a rare occurrence and my first April sighting of that bird in the Bronx. 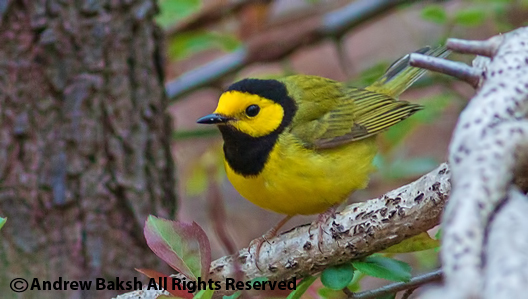 Over in Queens at Oakland Lake, I enjoyed nice looks at a male Hooded Warbler that was found by Eric Miller. This bird was very cooperative but might be now shying away from the path. I wonder if taping in the bird had anything to do with that as I have observed some birders playing tapes to no avail as the bird did not respond at least as far as I observed. 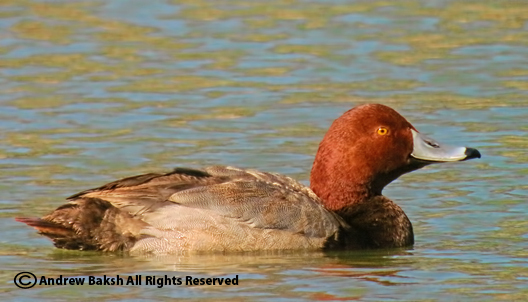 A drake Redhead continues to linger at Baisley Pond Park in Queens; while there are records of Redheads in April, this is still late for this bird to be hanging around and it will be interesting to see how much longer it stays. 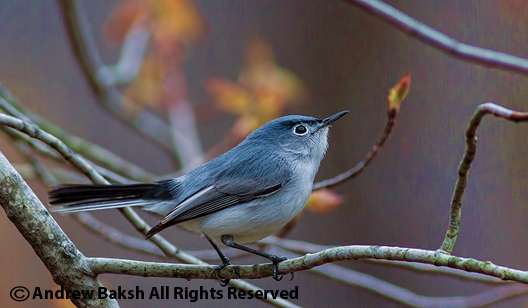 Other migrants showing up and establishing nesting territory include Blue-gray Gnatcatchers. Often tough to photograph, I got lucky with one that perched long enough for a decent photo. I'll have another update shortly from the field posting shorebird notes and photos as I conduct my shorebird surveys. I found and documented my first banded Piping Plover for 2013 on Sunday April 8th at Point Lookout Long Island. This after receiving a tip from my friend Tom Burke on a large number of PIPL seen in the area; after the conversation with Tom, I went to Point Lookout on Long Island and found the banded Piping Plover after searching for and counting 31 Piping Plovers. This number matched the number that Tom, Gail Benson and Andy Guthrie had counted. 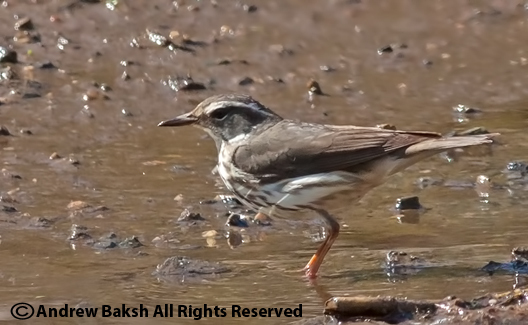 I got many photos of the banded PIPL, but then had an issue retrieving the photos off the CF card (still to be resolved). Luckily, I had taken some digiscope shots, so I was able to download a few which helped me to send out the band information for research. 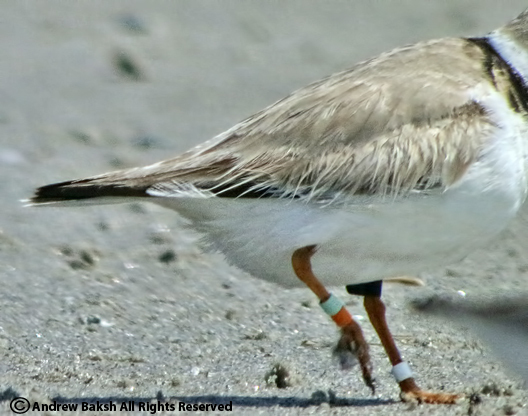 Dr. Cheri L. Gravatto-Trevor who is involved in the research on these banded Plovers, was quick to respond, confirming what I suspected, that this bird was a Bahamas banded Piping Plover. Dr. Cheri reported that the bird was banded in January 2010 in the Bahamas, at Seas Beach, Grand Bahama Island. The bird normally was seen at Jones Beach, Long Island and was reported there in 2010 and 2012. 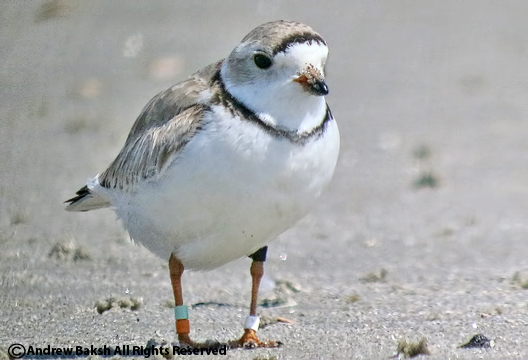 A few days later, another Piping Plover authority, Peter Doherty, contacted me to let me know that the very same bird was seen and reported from Montauk. The PIPL had moved further east. I was at Alley Pond Park in Queens this morning (as I wrote this post the time rolled over to Sunday, so it meant Saturday morning) on one of those off beaten paths looking at a Blue-gray Gnatcatcher when I received word of a Ruff (Philomachus pugnax) on Long Island. Michael McBrien and his dad had found a Ruff at Timber Point Country Club Golf Course in Suffolk County Long Island. I was excited, a Ruff in April. And so I hurried out of Alley to my car and battled the traffic into Long Island. It seemed too long, but I finally made it to the location joining several Long Island birders already present. Shai Mitra who was there pointed out the location on where to look and after a few minutes of looking a nice looking Ruff walked into view, but not for long as it walked back into the grass and kept on doing its peek-a-boo routine all afternoon. Eventually, the Ruff changed its location and those of us who had stuck around got better looks. After a while the crowd thinned out until there was Dale Dancis, Diana Teta and I alone observing the bird. Soon a few other birders joined us including Sam Janazzo and we continued to get decent looks of the Ruff. Sam left and so did Dale and Diana just as another birder John Gluth arrived. By this time the Ruff had flown into the Northen Marsh and was not being seen for a while. I decided that I would stick around and help John to re-find the bird. 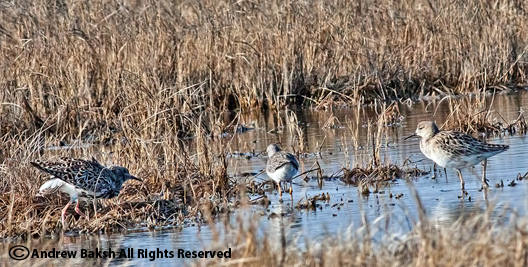 While looking for the Ruff, John and I incredulously found a second Ruff. 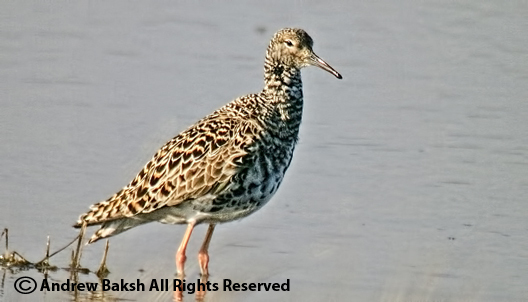 This second Ruff lacked the black from the first Ruff and was deemed a female (Reeve) as it seemed a bit smaller than the "black Ruff; however, it is not easy to tell the Reeve from the "Faeder" type male. See here for a more thorough explanation on the "Faeder Type Ruff". Some additional photos are presented below. 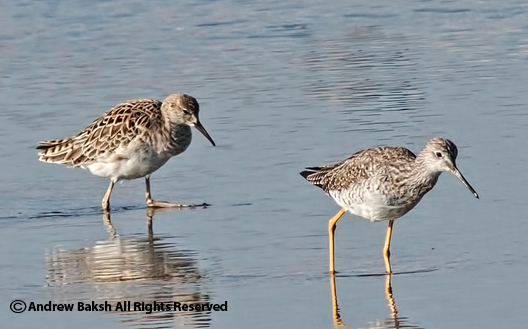 Reeve or Faeder Type Ruff behind a Greater Yellowlegs. Ruff - this bird reminds me of Rufus Ruff from Jamaica Bay last year. On Wednesday, I spotted a few spring migrants in the yard and was lucky enough to get some decent photos of a couple. 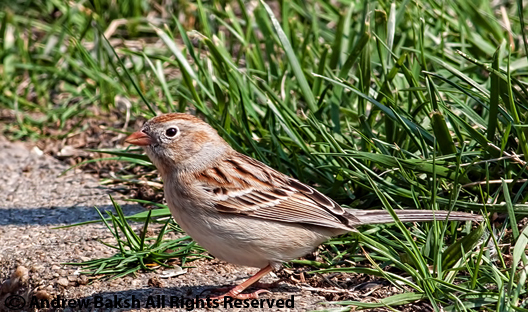 I especially like that I have a Field Sparrow visiting; a bird that I first noted in my backyard on October 25th 2010 and has made an appearance every year thereafter. Since, 2010 this is only the second spring appearance that I have noted of the Field Sparrow and today makes three days and counting as I just spotted a very wet FISP scrounging around for food in the yard. I keep very meticulous backyard records and last year I made a concerted effort to document every day the species that I noted in the yard from Mar-Apr to get an idea of spring migrants that I should expect. 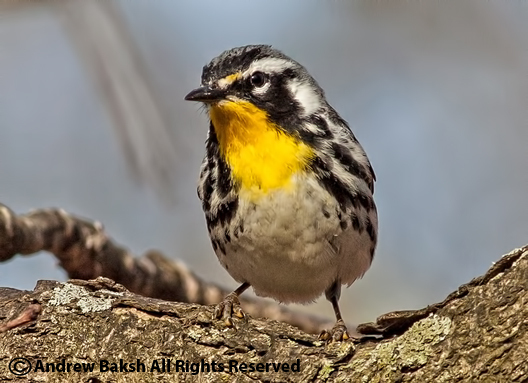 This year, I am not so vigilant, but I will try to spend some time to observe and hopefully document those returning spring migrants and any new ones that show up. 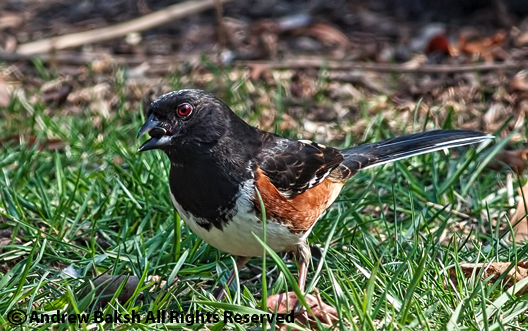 Other backyard notables from Wednesday, include Hairy Woodpecker, Hermit Thrush and a male Eastern Towhee. 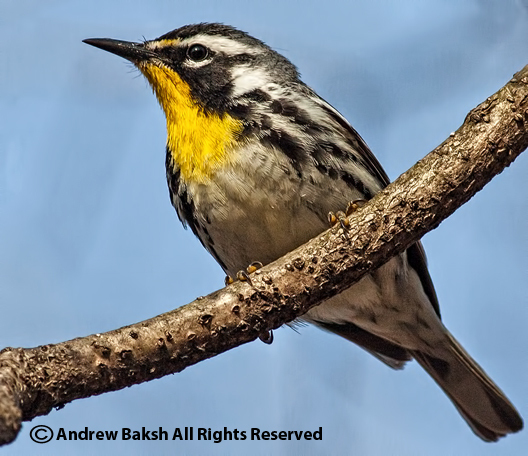 Two phone calls within minutes of each other on April 8th, from two Long Island birders Joan Quinlan and Sam Janazzo announced the arrival of one of the goodies warbler aficionados in the NYC area vie for each year. 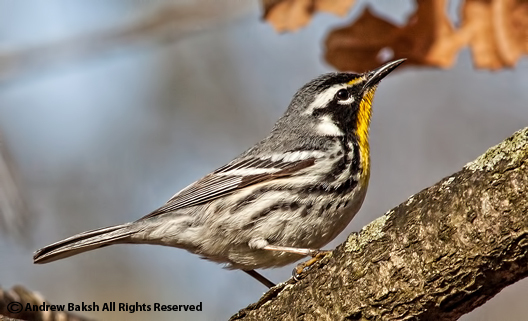 A Yellow-throated Warbler was evidently making bird watchers giddy with excellent views. The problem for many birders was that it was a week day and in the morning meaning many birders were stuck at work. I immediately whipped up a post to get the word out. I later learned that my post allowed several birders to get out and on the bird in a timely manner. I also got to see the YTWA, but I gambled on the afternoon since I was already tied to scheduled events in the morning. Once I arrived at Hempstead Lake in the afternoon, I spotted at least 4 birders prowling around including my friend Bobby Berlingeri. I suggested that we all split up to cover more ground. I picked a spot I felt had good sun, thinking it would be good for insects. 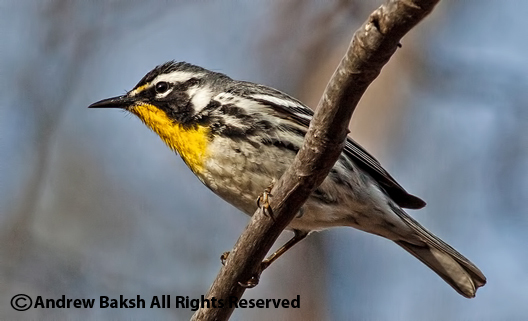 After looking and listening for about 20 minutes, the Yellow-throated Warbler put in an appearance. I quickly got the attention of all the birders present and together we got on the YTWA for excellent, extended views. I spent quite a long time studying this bird and actually got to hear it sing a few times. It was soft, but no doubt about it. 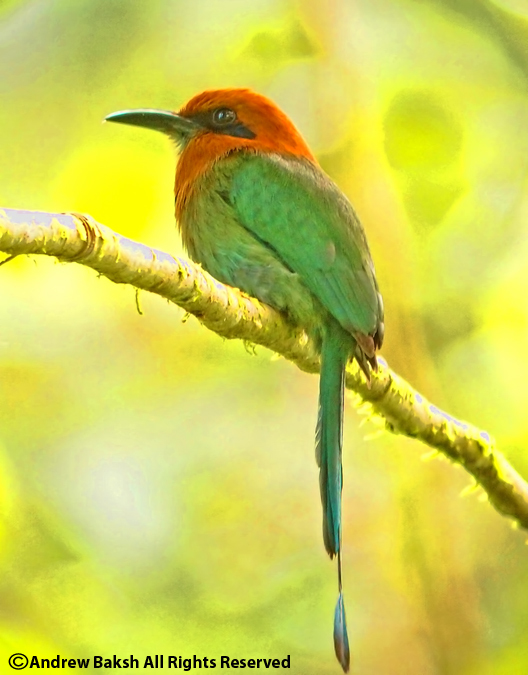 My first impression was that this bird had all white lores but closer looks confirmed some yellow on the lores and so I was left scratching my head wondering if I was looking at the subspecies Dendroica dominica dominica OR NOT. Further research and with some feedback from my friend Tom Johnson, it appears that the divisions in this species are not as cut and dry as previously thought and is being challenged by research into the genetics AND morphology of YELLOW-THROATED WARBLER; something that the field guides do not get too much into possibly because the research and findings are fairly new. A 5 Swallow day in April. Say what? I kid you not! Little did I know when I pulled into the parking lot at Hempstead Lake State Park LI, that I was in for quite a treat. Well...I am usually happy with any birds that I see, but to have a 5 Swallow day in April, is ...pretty cool. Andria and I had chatted about possible migrants at Hempstead and I was hoping that the two lingering Blue-winged Teals would still be around since they would be lifers for Andria. We quickly picked up the BWTE and had moved on to the loop when we were joined by my friend Patricia Lindsay. We three then birded the Hempstead loop picking up birds here and there. An American Woodcock, flushed which we all got looks at and then we began to work the Swallows on the lake. It was about 8:45 a.m. and it had not quite warmed up as yet, but there were Swallows out. 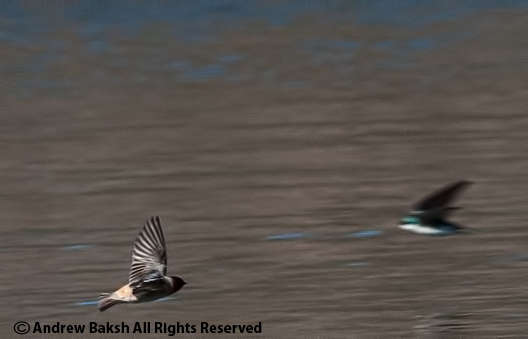 Quickly noticeable were the Tree Swallows and a Barn Swallow soon followed. Then, as I was working the flock over, a small Swallow zipped past my frame of view. 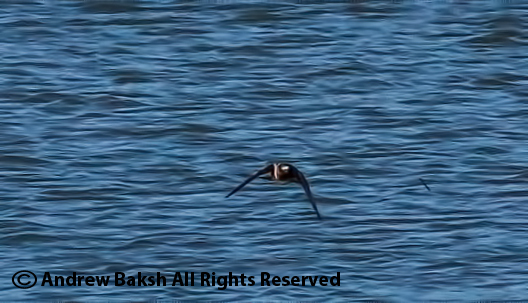 I hurriedly caught up with it and was quite surprised to find myself looking at a Bank Swallow. In my mind I quickly ran through the field marks, such as white underneath and brown on top, dark band across chest, extending down middle of chest before I could call out the bird, I lost it. I wanted another look and to get the others on it; but then Pat spoke up indicating that she thought she had seen a Bank Swallow. I grinned, validation baby! Yes, I replied, I had seen it as well. We then began looking through the flock; it was not long before we picked it up again and worked through the ID. Indeed a Bank Swallow in April. We eventually left the lake, which was a mistake as I picked up a message minutes later that another birder, Derek Rogers who birded the lake after us reported a Cliff Swallow. We hurried back over and after a few minutes picked up the Cliff Swallow. Then we added Swallow number five, when we picked up Northern-rough Winged Swallow. Pat split off and Andria and I continued to work the Swallows and I ended up managing a few photographs of the Cliff Swallow. 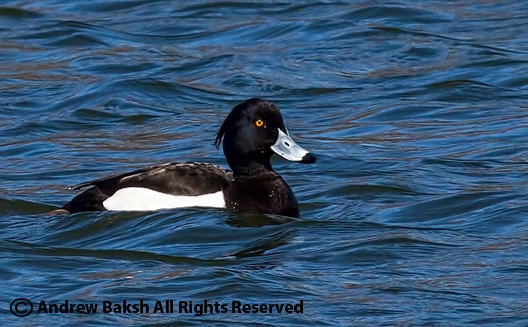 From Hempstead, Andria and I decided to try for the Tufted Duck at Heckscher Pond in Huntington LI. It would be a rare opportunity if this bird cooperated and be a much better experience unlike the cold day in January when I got my year TUDU. As luck would have it, we got the bird and excellent looks. I was amused at how lucky Andria was at seeing this bird. 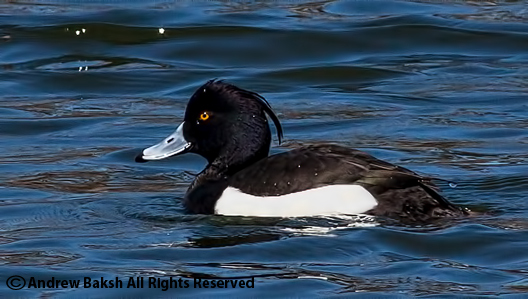 I recall, Tom Burke, Gail Benson and I spent hours looking for this species in the cold and here Andria was looking at a Tufted Duck with decent weather and having close up views. This was a successful chase and a nice bird to get to add to our spectacular 5 Swallow Day already in the books. 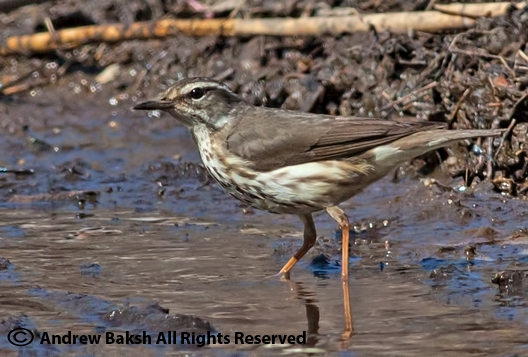 It seems painstakingly slow, but the migrants are making their way back north after wintering down south. Eastern Phoebes, Golden-crowned Kinglets, Tree Swallows, Snowy Egrets, Ospreys, and Great Egrets are some of the early arrivals showing up in several places. 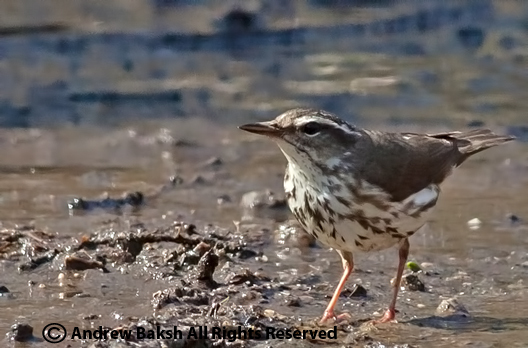 Today I had my FOS (first of the season), Louisiana Waterthrush that was seen and photographed at Oakland Lake in Queens. Here are some photos.